Check out this cute turkey, made from a baby food jar. I can't take credit for it. Trevor made it at his Book Club. But I thought it was too cute and easy not to share. All you have to do is paint the lid of a baby food jar brown, and then add colorful feathers cut from copy paper, googly eyes, and a copy paper beak and wattle. The final step was filling it with fall-colored M&Ms and candy corn. Have a wonderful Thanksgiving, everyone! I'll be back here December 2. We joined when I was in kindergarten and continued through third grade. 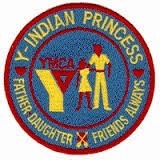 We moved on to the Pathfinders Father/Daughter program for fourth through sixth grade. In both programs, we had a weekly evening meeting, a monthly event or field trip, an annual banquet, and usually two camping trips a year. It was awesome. My dad had traveled a lot for work when I was young, so it was wonderful to have that time together. It didn't take long for my dad to take on a leadership role within our group. He led meetings, planned events, and was on various committees, always striving to make the program better. He was totally and completely committed to planning events and activities that would be fun for both the daughters and their dads. 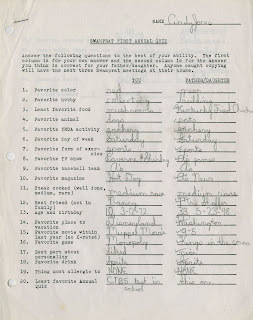 As we were talking about some of our favorite memories, he went to the file cabinet and pulled out a quiz that he had created. 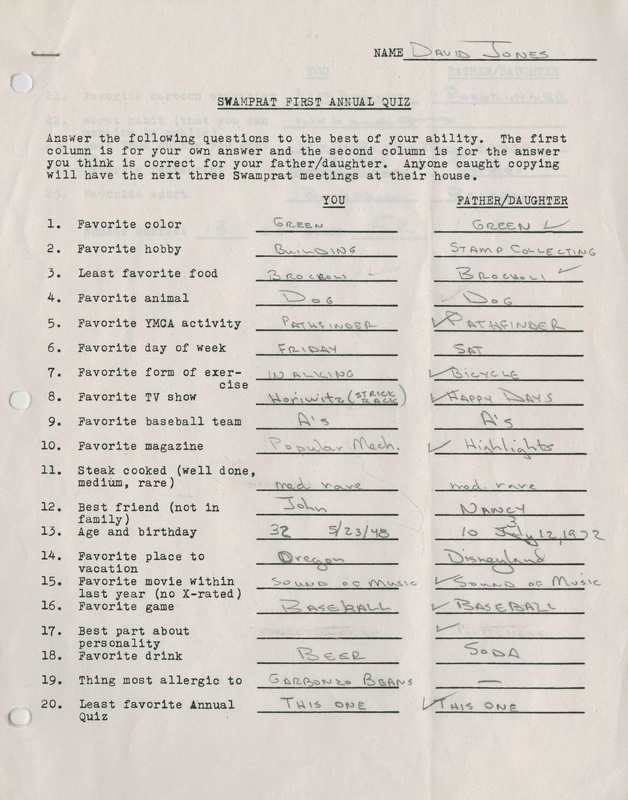 There were 25 questions for each girl and man to answer, first about themselves and then about their father or daughter. 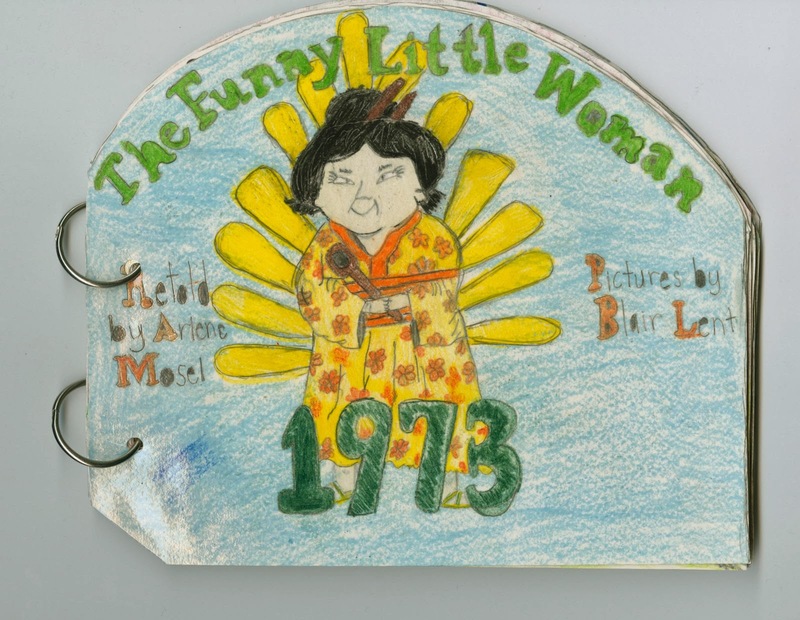 This is from 1982, when I was 10. Wow - talk about a walk down Memory Lane! 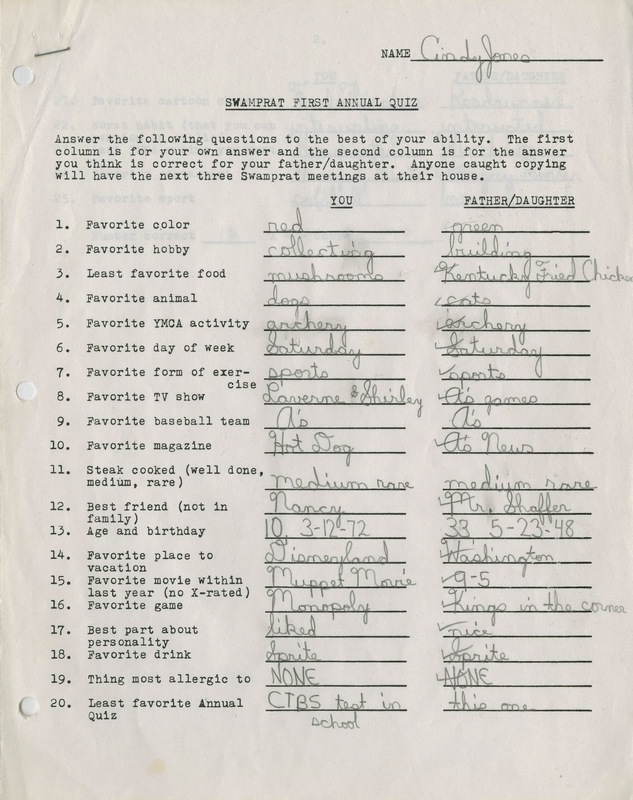 I love seeing my cursive writing and reading my answers about myself and my dad. I remember loving Laverne & Shirley, Monopoly and Sprite. I still don't like mushrooms (though I hate seafood far more) and I still order my steaks medium rare. I remember that red was my favorite color back then (though it isn't now). 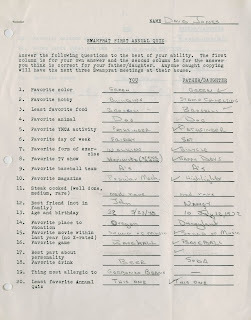 It's my answers about my dad that surprise me more. How on earth did I say he has no allergies, when he is hideously allergic to down? I can remember visiting hotel rooms where he could hardly breathe even after the down pillows were banished. And how did I not remember that he loved reading Popular Mechanics and watching 'Fight Back with David Horowitz' when I remember that so clearly now? He had quizzes from a few other years in his file cabinet as well. I scanned them and returned the originals. It was fascinating seeing how our answers changed from year to year. I'd like to start doing a quiz like this annually with Trevor. How cool would it be to be able to pull it out 30+ years from now? I'm so glad my dad hung onto this. Back in August, I was contacted by the owners of Scrapbook.com to see if I'd be interested in being part of a team working on a big project. Basically, they wanted to rewrite every product description in their store... tens of thousands of items. I'd be working from home on my own schedule. I said yes, went through training, and jumped in. I learned that most manufacturers provide their retailers (including Scrapbook.com) with a description of their product(s) that might contain measurements and other specs, special features, and/or tips to get the most out of the product. The quality of these descriptions varies greatly from manufacturer to manufacturer. Some are excellent... and some are not. In the past, Scrapbook.com has always used the manufacturers' descriptions on their product pages. Consequently, the customer did not always find a well-written, detailed or accurate description on each product page. In an effort to improve the quality and to make the products more searchable, each description would need to be rewritten. Each of us working on the project was assigned a chunk of about 200 products. We got to work writing descriptions, trying to make each clearly answer the questions a customer might have. When those were done, we edited each other's writing and then moved on to another batch of products. Repeat, repeat, repeat. The work can be difficult (when writing about tools or products I've never used) and tedious (when writing about each of the hundreds of slightly different items in one product line), but it also can be a lot of fun. I have learned so much already. I've ordered products from Scrapbook.com dozens of times and never gave the product descriptions a second thought. Never again! We play a lot of games in our family. Not only do we play a lot of games, but we invent a lot of games. An idea for a Thanksgiving-themed game popped into my head recently. I created a game sheet, then waited until my mom was in town for a visit to try it out, believing (correctly) that the game would be better with more than 3 people. Here's the game sheet. To save paper, I printed two on one sheet and then cut them apart. To play, each person needs a game sheet and a pencil. One at a time, someone selects a letter of the alphabet (we used Scrabble tiles) and announces the letter. Then each person has to write something they are thankful for that starts with that letter. For example, when the letter S was turned over, I could have written that I was thankful for scrapbooking. However, the goal is to match as many other people's answers as possible. 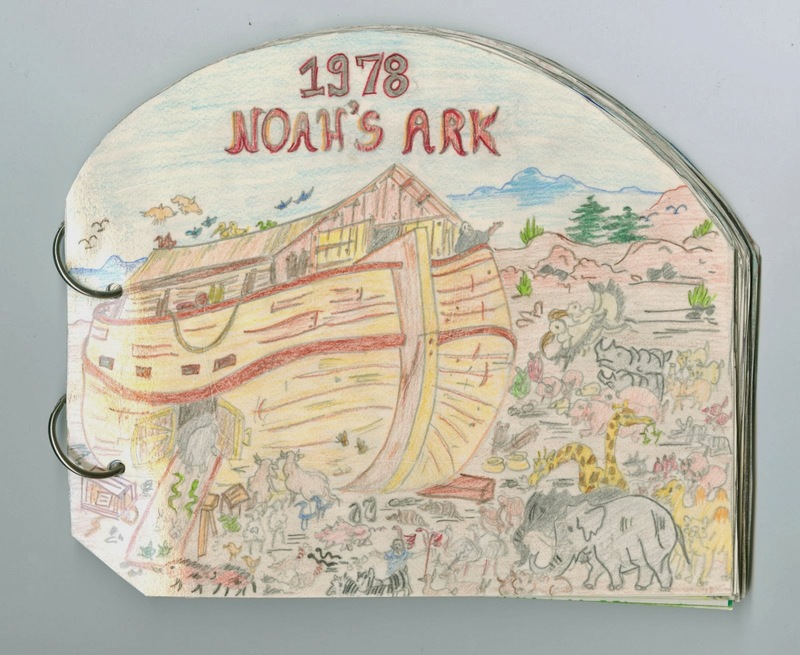 While I am certainly thankful for scrapbooking, I knew that there was no way that Steve, Trevor or Mom would write that, so it made more sense for me to pick something that one or more of the rest of them might mention, like spring or snow or s'mores. 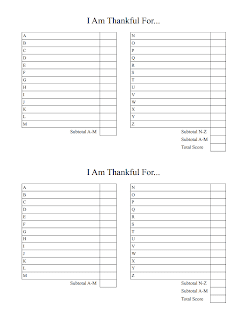 When each person has written down their item, you go around the table (or floor, in our case) with each person announcing, "I am thankful for _______." Then you score that letter. If your answer didn't match anyone else's, you get a zero for that letter. If you matched one other person, you earn 2 points because there were a total of 2 people who gave that answer. If you were one of four people who gave the same answer, you would earn 4 points. The total number of points possible is always the same as the number of people playing. It is not possible to earn 1 point. You then move on to the next player, who selects a letter. Continue until all the letters are used, then add up the scores. The person with the highest score wins. It was really fun. At first, my mom was dominating. She went for about half the alphabet without earning a single zero, then she got her first zero while the rest of us were matching each other more frequently. In the end, Steve and I tied for first place with 33 points. While playing with four people was fun, I think it would be even better with a larger group. If you'd like to play, you can click here to print a copy of my game sheet. Let me know if you end up playing it. I'd love to hear what you think! Digging through the school pictures from my teaching days got me thinking about my 5th graders and some of the awesome things we did together each year. I've blogged about our Scrabble tournament, cooking in the classroom, Civil War Living History Camp on Angel Island, the time my class starred in an instructional video, and when we were photographed for a book. I've never blogged about the Caldecott Project. I am, obviously, a huge fan of books. Throughout the school year, I would introduce my students to as many great books as I possibly could. Since it was 5th grade, we spent most of our time reading chapter books, but toward the end of the year we did a huge unit on Caldecott-winning books. 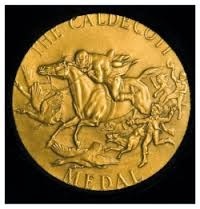 As you might know, each year the Caldecott award is given to the most distinguished American picture book for children. The award has been given each year since 1938. 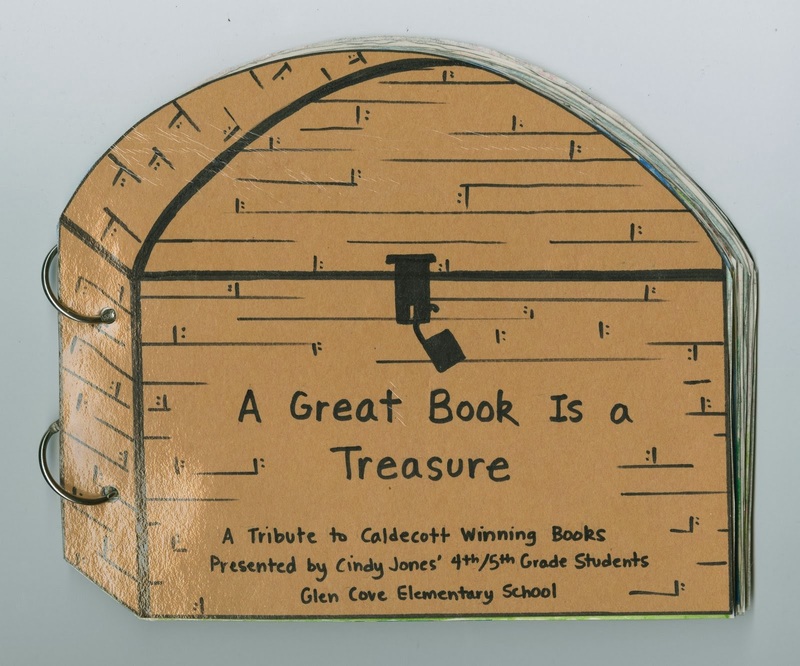 To begin each year's Caldecott Project, I would teach the kids about the history of the Caldecott award and we'd work together to brainstorm what characteristics the winning books might share. Then I'd gather up as many of the winning books as I could find and display them around the classroom. Over the course of a week or so, they would read and evaluate as many of the books as they could, filling out a form, giving each book a grade, and summarizing its strengths and weaknesses. We shared our evaluations and discussed our favorites and why we thought they deserved the Caldecott honor. Then, each student would select his or her favorite Caldecott book for deeper study. And here are a few sample pages. This is "The Funny Little Woman" (1973 winner), as illustrated and summarized by JP. 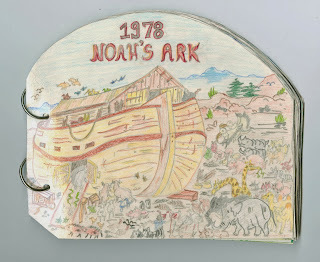 Here is 1978's winner, "Noah's Ark," as drawn and summarized by Levi. Because our school was year-round back then, we were in school when the county fair took place. We always entered some sort of class project, and then would then take a field trip to the fair to see our exhibit. I'm proud to say that the Class of 2000 earned a first place ribbon (and the corresponding $15 premium) for this awesome book. They were absolutely thrilled and I couldn't have been more proud. 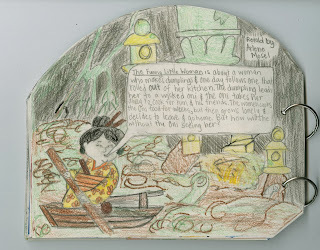 The final part of our Caldecott Project was the hardest for many of my students. Each had to take the book they'd been studying and use it to give a presentation to another classroom. Their assignment was to explain the history of the Caldecott award and then read the book to the class, holding it teacher-style (the pictures always facing the audience) so that everyone could admire the award-winning illustrations. The teacher they were visiting would evaluate them on their public speaking skills (eye contact, loud voice, good expression, etc.) during the presentation. My students worked extremely hard preparing, many of them reading out loud over and over to siblings, parents, neighborhood kids, or the family pet. The evaluations I got back from the other teachers (often former teachers of my students) were glowing. 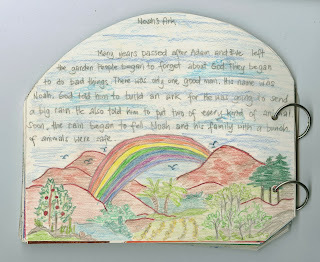 I loved everything about the Caldecott Project and hope that my former students have fond memories of it. (I don't think any of them were too scarred by having to give that presentation...) When people ask me if I miss teaching, my thoughts always go to projects like these and all the other ways in which we had fun while learning. So many great memories. Trevor was sick earlier this week, so I used the unexpected day at home to do a variety of chores that I'd been putting off, including defrosting the freezer. (Glamorous life I lead, I know.) As I was cleaning out the freezer, I came across some cranberries. They were left over from the last time I made the amazingly-delicious Frozen Cranberry Treat. Rather than put them back in the freezer, I let them defrost and made one of my favorite quick breads - Cranberry Walnut Bread. Because I didn't have enough cranberries to make my go-to recipe (which makes two loaves) as written, I improvised. Basically, I halved all of the structural ingredients (flour, egg, leavening, etc) but only reduced the quantity of mix-ins (cranberries, nuts, lemon zest) slightly, or not at all. I made a few other slight changes and the resulting bread was perfect. This is my go-to version from now on. Grease the bottom only of a 9x5x3 pan. Combine dry ingredients. Add wet ingredients and stir until combined. Fold in cranberries and walnuts. Pour the batter into the pan and bake at 350° for 55 minutes or until a toothpick inserted in the center tests done. Let cool in pan for 10 minutes, then use a knife to loosen the sides. Turn out onto a wire rack and let cool completely. Everyone knows that it's important to back up your photos, as it would be heart-breaking to lose the only copy of a precious photograph. Years ago, we were taught to keep negatives in a fire-proof safe, away from the originals... just in case. In the digital age, we copy photos to a secondary hard drive, burn photos to CDs, or use an online backup service. Regardless of how you do it, it is worth your time to back up irreplaceable photos. Just as important, but often overlooked, is the importance of backing up our scrapbook layouts. Wouldn't it be just as devastating to lose your scrapbooks as it would your photos? Actually, I think it would be more devastating. I treasure my scrapbook layouts not just for the photos on them, but for the handwritten journaling, handmade embellishments, and one-of-a-kind memorabilia I used. While I could replicate some of my layouts if I had to do so, there are others that I could never recreate. Here's one example. I made this layout when Trevor was three to document his love of mazes. For the title, I had him write his name directly on a nametag. His adorable 3-year old handwriting is what I love best about this layout. If something happened to this layout, I could never recreate that part of it. Now that Trevor is 7, he obviously writes much differently than he did as a preschooler. Fortunately, I don't have to worry about "what ifs" because I back up every layout I make, without fail. As soon as I finish a layout, I scan it. It's tempting to wait until there's a stack that needs scanning, but I don't allow myself to do that. I scan each layout immediately after finishing it, even if I'll be finishing up a second one 30 minutes later. If my original layout were ever ruined, I could print a high-quality copy from the scan. I don't stop there though. Any disaster that ruins my scrapbooks could ruin my computer as well, so I immediately upload the layout to my blog. Once it's safely stored somewhere other than my house, I take my time uploading it to scrapbook.com and our personal photo gallery. 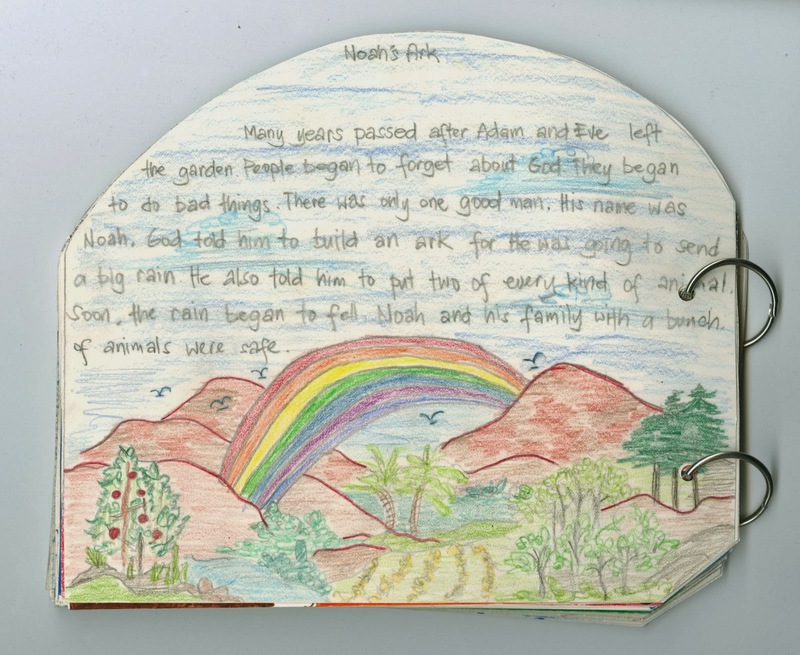 While chances are I will never suffer the devastation of something like a fire or flood, I feel much more comfortable that if I do, the contents of my precious scrapbooks won't be destroyed. Do you back up your layouts? Over the past few months, I've had the pleasure of reconnecting with a handful of my former 5th grade students, who now range in age from 18-29. I think about "my kids" often, wondering how they are and what they've accomplished. It is always great to hear from them. Most of them have found me through my blog or Facebook. Almost without exception, they see my picture and comment that I haven't changed a bit. 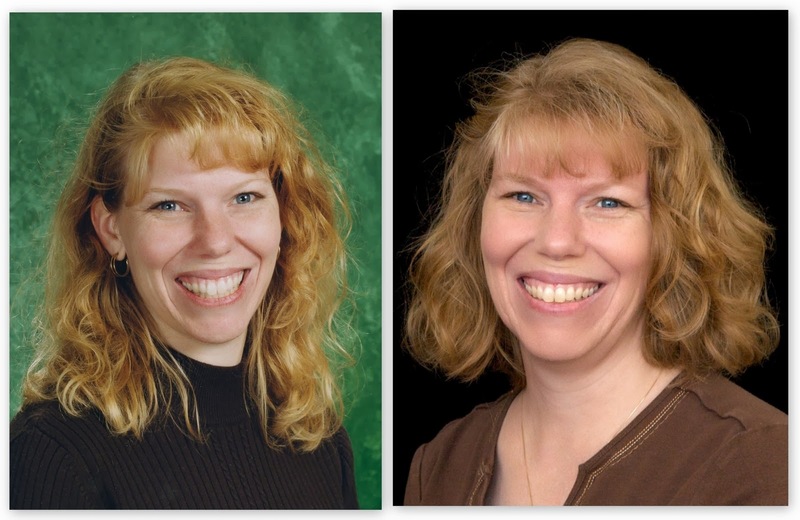 When the most recent student found me on Facebook, she said that I looked exactly the same as I did all those years ago. For fun, I decided to dig out my old school pictures to see if she was right or just being polite. On the left is my school picture from 2000 when I was 28 years old. On the right is a picture Steve took of me last Saturday when we were doing our latest family portraits, age 41. While I was scanning the old picture, I realized that I still had a 2010 portrait of me at the top of my blog. I've updated it now. 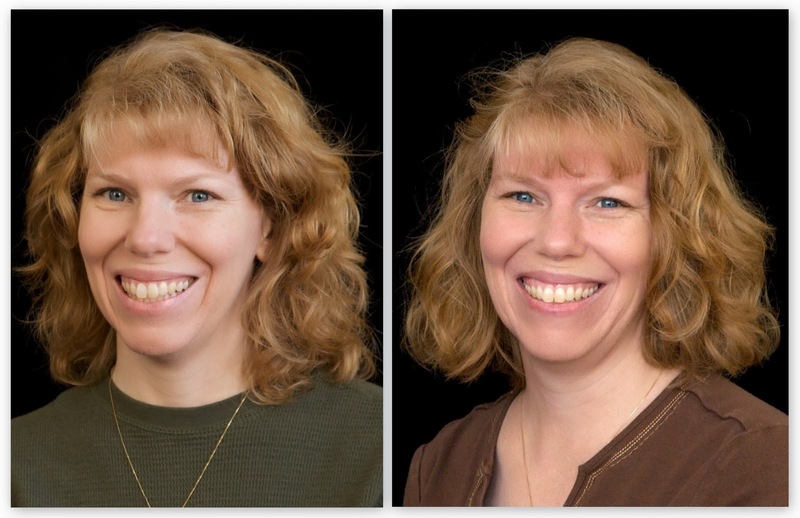 Here's the side-by-side of the old picture and the new. Not too different except for my hair. It was more flattering three years ago. I think I'm going to get long layers put back in the next time I get it cut. While my appearance hasn't changed all that much from 2000 to now, my daily life is 100% different. That really hit home while recording everything I did last Thursday. In 2000, I was single, living alone, with no pets. I commuted to a job I loved teaching 5th graders. I was working on my master's degree and Administrative credential. I spent what little free time I had rehearsing and performing with a ballroom dance troupe. I had not yet begun suffering from IBS. I didn't make much time for crafting and I hadn't even heard of blogging. I haven't changed a bit? Definitely not true, though most of the changes don't show on the outside. 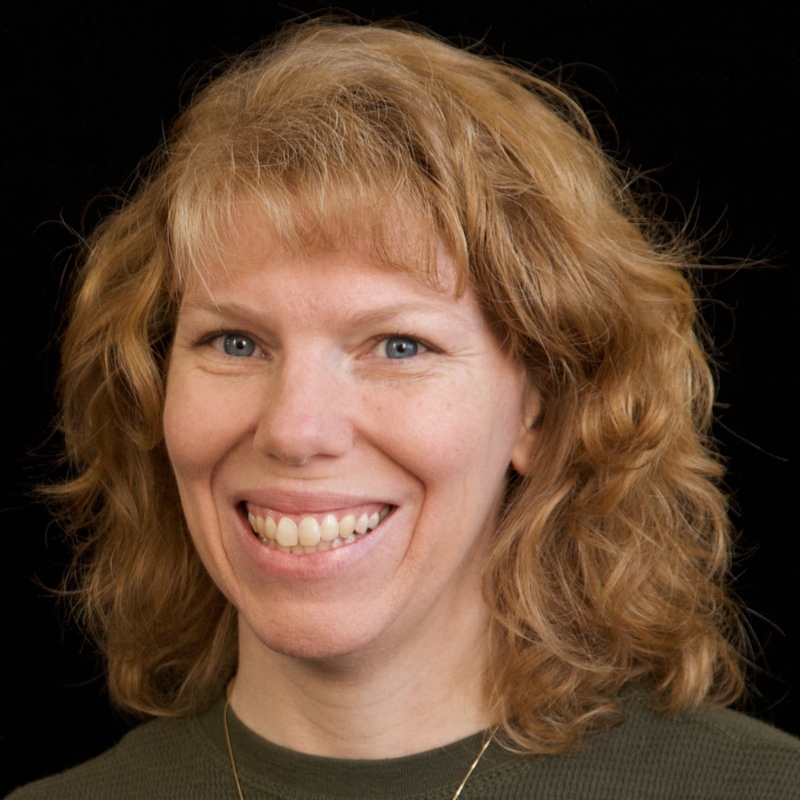 Every once in a while, my friend Amanda writes a "Day in the Life" post on her blog. And every time she does, I comment that I should try it one of these days. I love reading hers and those of all the other bloggers who post them. My struggle has been feeling like I don't really have typical days. There's a lot of variety in what I do day-by-day and I didn't want to select a day that wasn't representative of my real life. But when I thought about it, my day-to-day now in November 2013 is literally 100% different than it was in November 2003, for example. Years from now, it will be interesting to see what my life was like right now, so I decided to just pick a day and not worry about the things that might be somewhat atypical. 5:10 - I woke up at 5:10, which is pretty normal for me. Steve got up before me today. With all the traveling he's been doing to Akron, he's decided to stay on Eastern time after getting home from our Florida vacation until after his next business trip. The first thing I did was go downstairs to let Trouble out of his cage and to feed him. Then I headed back upstairs to answer emails, check Facebook, and do a little bit of work for Fun Family Crafts. 6:00 - I showered and got dressed (long-sleeved shirt and jeans) and headed back to the computer to read blogs. Many are for pleasure, but others are for my Fun Family Crafts job. I comment on some blogs, Pin some images to Pinterest for possible submission to Fun Family Crafts, and just scan through the vast majority. 7:00 - If Trevor isn't awake by 7:00 on a school day, I wake him. It's about 50/50 whether he wakes up on his own. Today I had to wake him. I'd seen an adorable rabbit video on my favorite rabbit blog earlier, so I showed it to him. I made his breakfast while he got ready for school. Today he had peanut butter toast and orange juice. While he ate, I packed his lunch (a cheese stick, raisins, pretzels, and some pistachios, plus a fun-size Milky Way from Halloween). After he ate and brushed his teeth, we had a few minutes to play together before we left for school. 7:40 - Time to take Trevor to school. His school is about 1.3 hilly miles from our house. While we technically could walk (it's too hilly for him to bike or use his scooter), instead we drive a little over halfway to the flat area and walk the rest of the way. School starts at 7:55. Once I see that his teacher has arrived to pick up the line of kids, I walk back to the car. If I have errands to run (groceries, Target, etc) I'll do those, but I took care of all that yesterday. Today I headed back home. 8:05 - The moment I arrived home and put my purse down in the kitchen, Trouble started dancing around, as he has trained me that 8:00 is time for a morning treat. I gave him his favorite, a piece of broccoli. Then I made my own breakfast. Today I tried Blackberry Hills for the first time. I was hoping it would be an acceptable substitute for my beloved (and apparently discontinued) Strawberry Fields. Sadly, it was not. 8:15 - I headed back upstairs. I answered a few final emails, scanned a few more blogs, wrote a blog post, and then got down to work. My main goal for the morning was to edit the last chunk of product description rewrites for my job with Scrapbook.com (which I started in September and have not blogged about yet). 11:40 - I took a few minutes to update my journal about Trevor. Every day, I write anywhere from one sentence to multiple paragraphs about his day, new accomplishments or challenges, illnesses or symptoms, or anything else notable. It is now a 235-page document. It is amazingly awesome to look back on for scrapbook journaling, or if there's a medical concern, or to simply read and reminisce about his younger years. 11:55 - I went downstairs and put a load into the washing machine. 12:00 - Time to make lunch. Steve works from home, so we eat lunch together almost every day. Today we had peanut butter and jelly sandwiches (full sandwich for Steve, half for me), apple slices from last weekend's visit to Apple Hill, and Cheetos. While we ate, we watched part of the Face Off finale on the TiVo. 12:25 - As soon as I finished eating, I dug around in the freezer looking for potential soup ingredients for dinner, settling on ham, onions and celery. I put the ingredients for flaxseed bread into the bread machine (without starting it) and headed back upstairs. 12:40 - I turned on the latest episode of the Paperclipping Roundtable and went into the craft room... which required stepping over the mess from a bunch of previous projects. Being on vacation for two weeks in October meant that as I rushed to meet deadlines before we left, I didn't clean up after one project before starting the next. 1:10 - I make it a priority to have at least a little bit of creative time every day, so after cleaning for awhile I took some time to start working on a new layout. As you can see, there is quite a bit more cleaning that needs to be done, but that can wait. 1:25 - The Paperclipping Roundtable podcast was still going as I put away laundry. The topic ("Is Scrapbooking Dead?") was very interesting. After laundry, I did more chores upstairs (dusting, organizing, bathroom cleaning, etc). 2:20 - I started the bread machine and then it was time to leave to get Trevor from school. Just like in the morning, I drove partway and walked the rest of the way. I noticed that the sidewalk was freshly swept; just this morning, we'd crunched dozens of acorns as we walked. 2:35 - Usually I meet Trevor at the front of the school, but today was unusual. It was his last day in his current classroom before transferring to another 2nd grade classroom. I met him by the new teacher's door so that we could meet her and make sure Trevor would feel comfortable on his first day. She showed him where he would sit and explained some procedures, asked him some questions, and answered some of his. She seemed absolutely wonderful and we both left excited that he would be in her class. 3:10 - Trevor and I headed directly to the library. On average, we go to the library once every two weeks (far more often during the summer). Trevor checked out 9 books, including four from the Weirder School series that we both love. 3:45 - When we got home, Trevor and I emptied his backpack together and went through his graded work. Steve came out of his office to say hi and to ask Trevor about his day. Trevor grabbed a sheet of paper to demonstrate something new he'd learned in math. 3:50 - Ordinarily, we'd work on homework next, but it was the last day before a 4-day weekend (Friday 11/8 was a teacher workday and Monday 11/11 was Veterans Day). Trevor chose to play with Legos. I sat on the couch nearby and read the newspaper. 4:00 - Time to start dinner. I headed outside to see what I could harvest to add to the soup ingredients I'd found in the freezer. I pulled out three carrots and cut them up - green for Trouble and orange for the soup. 5:30 - Dinner time! We had a version of Cheesy Beer Potato Soup and the homemade flaxseed bread. 6:00 - We usually have Cub Scouts on Thursday nights, but it was canceled this week. As much as we love Cub Scouts, it was nice to have an evening where we didn't have to go anywhere. We played a game together, then Steve and Trevor built Legos while I did the dishes. Then we prepped for our early morning ferry ride to San Francisco to visit the Exploratorium. 7:30 - Trevor got into pajamas, then we started watching an episode of Cutthroat Kitchen. 8:00 - When the show ended, Steve tucked Trevor into bed and reminded him that we'd be getting up very, very early the next morning. I cleaned Trouble's litterbox, fed him, and closed him in his cage for the night. 8:15 - Steve and I finished watching the finale of Face Off that we'd started at lunchtime, then started an episode of Top Chef. 9:00 - I've always been a morning person, ready for bed by about 9:00 pm. With Steve trying to stay on Eastern time, he now has no problem with my unusually early bedtime. I read for about 15 minutes before falling asleep. 1) Flatten and decorate an empty cardboard tube to make an upcycled gift card holder. 2) Turn patterned paper, a string of beads, and a button into a little purse that holds a gift card. 3) Decorate a small wooden frame and use it to hold a gift card. 4) Make a simple gift card envelope from patterned paper. Obviously, any of these types of gift card holders will work with any theme. Just change the colors, papers or embellishments to match the occasion. If any of you have other ideas for creative gift card holders, please tell us in the comments! Last Christmas, Trevor and I had great fun making bars of soap with coins embedded in them as gifts for his cousins. When I give a gift of money, whenever possible I try to do something interesting with it. For my latest attempt, I made a Dollar Bill Dispenser. I started by taping 32 dollar bills end-to-end. Then I rolled them up. I cut a slit in a cardboard tube and painted the whole thing purple. I slid the roll of money into the tube with the end sticking out of the slit. Then I taped a PULL tab to the end. I rolled the last bit of money in so it wasn't visible. The last step was wrapping the tube with tissue paper. I cut a slit so that the PULL tab stuck out, then used tulle to tie the ends closed so that the roll of money couldn't escape. Once it was all wrapped up, I was nervous that it would get caught up and not come out of the tube smoothly. I really wanted to test it out, but that would have meant rewrapping the whole thing, so I just crossed my fingers. Fortunately, it worked beautifully and Courteney was delighted with her gift. Trevor and I have made Thanksgiving decorations. I've been making Christmas and winter crafts to publish at Fun Family Crafts. I'm working on spring-themed Scrapbook.com assignments that go live in March. 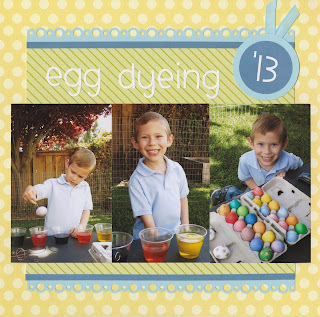 I finished the first of two layouts from last Easter. Fall, winter, spring... I feel like I'm constantly living in at least three seasons at once. 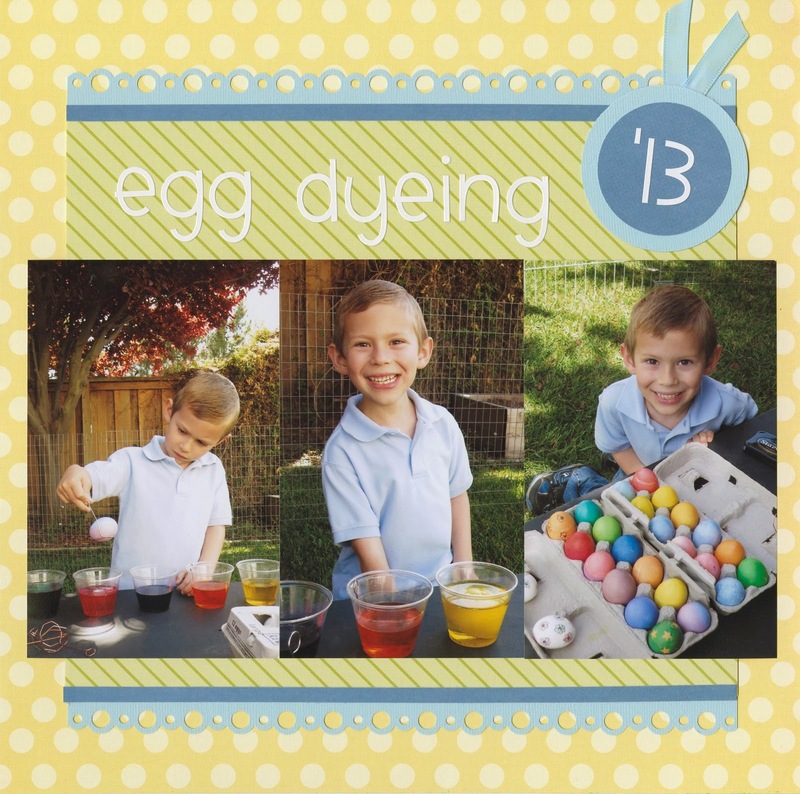 It's a weird feeling to go from making turkey decorations to researching daffodil crafts to Christmas crafting and then scrapping Easter egg dyeing all in one day.